This diner classic is served open-faced to not only keep the calories down to a mere 200 per sandwich, but it also allows you to easily melt the cheese under the broiler. We top our Tuna Melts with sliced tomatoes for a hint of fresh flavor and contrasting texture, but don’t forget the knife and fork! Add the light mayonnaise, onion, mustard, parsley, lemon juice, salt, and pepper to a mixing bowl, and stir to combine. Add the tuna to the mixing bowl, and gently fold into the dressing to create the tuna salad. Toast the wheat bread until golden brown. Transfer the toasted bread to a sheet pan. 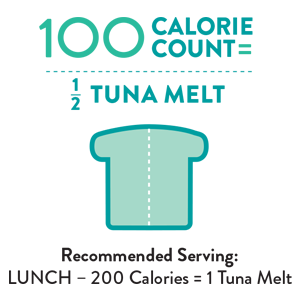 Place the oven rack in the second highest position, and set the broiler to high. 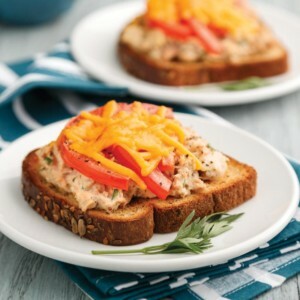 Top each slice of toast with ¼ of the tuna salad. Arrange slices from ½ of a tomato over the top of the salad on each sandwich. Sprinkle the tomatoes with additional salt and pepper to season, if desired. Sprinkle the shredded cheese evenly over the top of each sandwich. Broil for just 3–5 minutes, or until cheese has melted and begins to brown. *Natural and organic light mayonnaise are in most supermarkets and are made with all natural ingredients. HELPFUL TIP: Light bread is sold in loaves in the normal bread aisle. It usually contains only 45 calories (or less) per slice and far more fiber than ordinary bread.